Easter is one of my favourite times of the year. Spring is in the air and chocolate is in my stomach! I love the pastel colours, the cute little chicks everywhere and of course the yummy food. Easter really is a sweet tooth’s paradise! Easter eggs are of course a given, but then there are hot cross buns, simnel cake, creme egg brownies., mini eggs, the list goes on and on. Making hot cross buns may seem like a bit too much effort, especially when there are so many different ones available to buy! But I truly find them one of the most therapeutic things to bake. Watching them rise gives you a beautiful sense of achievement and satisfaction. The smell that will fill your house as they bake is better than any candle you could buy. And, of course, the taste of a freshly baked, super soft, homemade hot cross bun, just can’t be beaten! Heat your milk in a saucepan with the vanilla, until it just comes to the boil, then add the butter to melt. Pop the flour, ground cardamon, yeast, sugar, salt in a large mixing bowl, make a well in the middle and add a beaten egg, and the slightly cooled milk. Bring the mixture together, then either knead by hand or if your feeling lazy, like I usually am, let a free standing mixer do the work for you. You want to work the dough until it is smooth and elastic. Pop your dough in a lightly oiled bowl, cover with clingfilm and allow to prove, for about an hour, or until doubled in size. Pour your chocolate chips over the dough, and knead through until they are well distributed. Recover with clingfilm and allow to prove for another hour. Now it is time to shape your buns, I got 12 buns out of my mix, of roughly 75g each. If you split the dough roughly in half, then half again etc. Weighing each piece will just allow to create equally shaped buns! Roll each section of dough in your hand to create a ball then place on a lined baking tray, leaving enough room for the buns to rise. Cover again with clingfilm and leave for there final hour prove. Preheat your oven to 220/200 degrees fan. Mix the plain flour with enough water to form a thick paste, adding a little at a time. Pop into a piping bag and snip of the tip. Once your buns have proved pipe a cross on the top of each one and then pop your ray in the oven. The buns should take around 20 minutes to bake, until they are beautifully golden brown. Once out the oven, brush the apricot glaze over each one. Leave to cool or enjoy fresh out the oven! I am currently in the midst of planning for my first trip to Rome! Rome has held one of the top spots of my travel bucket list for quite some. Primarily and unsurprisingly for the food. Italian food is without a doubt my favourite. I would happily live my life on a diet of pasta and gelato- and some days I do just that! My mouth is watering already in anticipation of bowls upon bowls of Spaghetti Carbonara and Cacio e Pepe. I of course shall squeeze in a good few slices of pizza as well, do not worry! Then to start on the sweets. I have already found Gelato shops in all different areas of Rome, so I know there is always somewhere close by in a hunger emergency. Although I am not sure hunger shall ever strike, especially as I plan on filling my handbag with as many Italian sweets and pastries as possible, from every single bakery we pass. Cannoli upon cannoli upon cannoli. Preheat your oven to 180’160 fan and line a large baking tray with baking paper. Whisk together the eggs and caster sugar, until light and pale and fluffy. Fold in the flour, cocoa, bicarb and then the chocolate chips and hazelnuts. Tip out onto a floured surface and knead slightly to make sure everything has come together and then roll the dough into a long sausage, roughly 3cm wide. You may need to put the dough diagonally on your tray or use two trays and split the ‘sausage’ in two! Pop into the oven for 30 minutes, until crisp on top. Once out the oven, allow to cool slightly, then slice on the diagonal, roughly 1-2 cm wide, and lay flat back on your baking tray. Return the tray to oven, a a slightly lower 160/140 fan, and bake for a further 10 minutes, then flip each bicotto over, bake for a further 5 minutes. Remove from the oven, allow to cool and enjoy dipping into a delicious cup of coffee. I’m not sure I have ever been more confused when I discovered Pancake day was in March this year! Pancake day has always been the joy in cold and usually pretty bleak February! But alas, this year we have had to wait that bit longer, for which I am sure, the pancakes will taste every bit more sweet. It will be unsurprising to learn that Pancake Day is one of my favourite days of the year! I am not one to limit myself to one day a year to eat pancakes, no definitely not! For me a pancake day happens on average probably once a week! But a real and viable excuse to eat pancakes for every single meal of the day and face no judgement or criticism- it is a dream come true of a day! I have very sweet memories of pancake day growing up, excuse the pun. Every year without fail we would make crepe style pancakes, slathered in golden syrup, or sprinkled with lemon and sugar. (However back in those days I am sure I was expected to eat a balanced dinner beforehand). I liked to take it upon myself to eat as many of these delicious crepes as possible. One fateful year I took it slightly too far and I’m not sure I have ever felt quite so full since! Hours lying on the sofa did little to recover and I am not sure I have eaten a crepe since! Luckily it was around this time that I discovered the American Pancake, or what I now consider to be the only Pancake for me! Fat, fluffy pancakes dripping with maple syrup and topped with super crispy bacon. Or stacked high, smothered in Nutella scattered with strawberries. Perhaps even, with a giant scoop of icecream melting on top! Separate your eggs, whites in one bowl and yolks in another. To the yolks, add the vanilla, flour, baking powder and milk and whisk to a smooth batter. Using an electric whisk, whisk the egg whites until they form stiff peaks. Gently fold the whisked egg whites into the batter mixture. Heat your non stick pan with a small knob of butter, I like to use an individual sized pancake pan, just so they are all the same size but any small non stick pan will do! Pour a dollop of the batter into your pan, cook for a couple of minutes until the top starts to bubble slightly and the base is firm, then gently flip over and cook for a further few minutes, until golden on both sides. 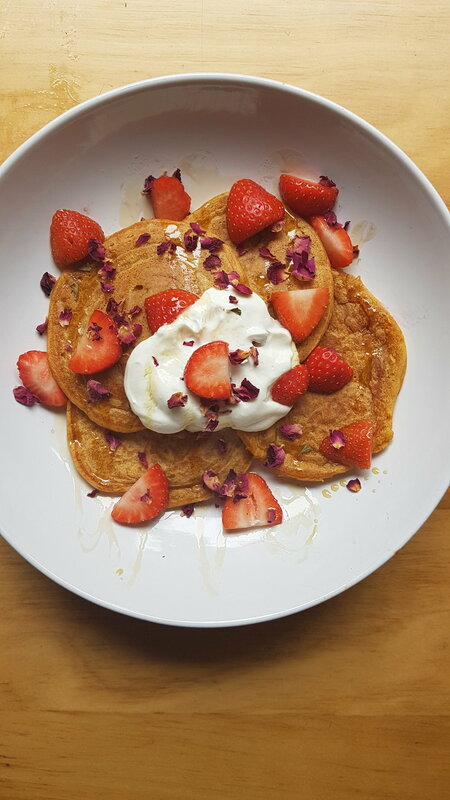 Pop into a plate in the oven to keep warm and carry on making pancakes until all the batter is gone! Serve up your pancakes, warm from the oven, and serve however you wish! Drenched in maple syrup, scattered with blueberries and topped with crispy bacon is my current go to! Enjoy! I like to think of myself as a romantic. Not an over the top soppy cheesy romantic, well maybe sometimes, but I think romance in all it’s forms has a place now and again! Valentines day is easily seen as a pointless over commercialised ‘holiday’ but I like to see it as simply an excuse to show a little bit more love. Whether that be to your partner, your friends, your family or simply a kind smile to a stranger you pass. Let’s face it, nowadays any reason or excuse for there to be a little bit more love in the world, can’t possibly be a bad thing! I have been lucky enough to have been brought up going on holiday to the Lake District every single year with my family. It has become my second home and a place very close to my heart. I am definitely more of a country girl than a city girl. A long walk in the countryside is my ideal way to spend a day, other than in my kitchen, of course! Getting away from it all, spending some quality time with my family, breathing in all the fresh air and of course, enjoying some delicious food! Hours spent out amongst nature also allows me to indulge in one of my favourite hobbies, photography. I won’t bombard you with too many, just enough to show you the beauty of the place, if you have yet to be lucky enough to visit. Perhaps I feel a certain affinity with the Lake District for it is the birth place of my very favourite of all the desserts, Sticky Toffee Pudding! Our trips up to the lakes always include trips out to local cafes to sample some of their delicious treats. After all, a long walk is made all the sweeter when there is a sweet treat awaiting you at the end! One of our favourite places to go is just a short, but beautiful walk away from where we stay in Elterwater, called Chester’s By The River. The rest of the family usually go for one of their delicious salads, but I can never say no to the cakes! This trip I went for a blackberry scone and it did not disappoint! We also stopped in for breakfast before our sad journey home and I managed to be swayed away from cake for breakfast for one of their peanut butter, banana and nutella toasties. Need I say any more? I also managed to indulge my pancake cravings after a long walk over to Grasmere at Heidi’s Grasmere Lodge. The nutella smothered pancakes were just what I needed to refuel for the walk home! Whilst on the subject of food, I just have to mention The Grasmere Gingerbread Shop! With every visit to the Lakes, there is a visit to the world famous Grasmere Gingerbread for a pack of the best Gingerbread in the world. It may be a bold claim but I believe it to be wholeheartedly true! Howdy Strangers! Apologies that is has been a little while! I have been tucked up in a winter cocoon, covered in many blankets, fuelled by perhaps a slightly excessive amount of Christmas chocolates. But I have emerged, finally, with some very exciting news to start off the year of 2019! 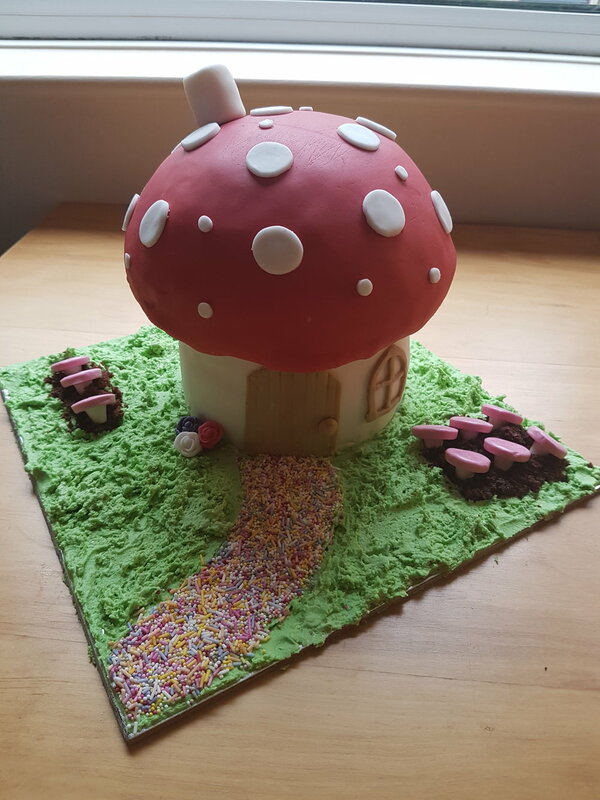 I have finally, after 5 years lacking the self belief needed, decided to dive in at the deep end and put my heart and soul fully into Louise's Cakes! I am now officially a full time independent business owner, making Louise's Cakes my sole job, income and focus! I'm not sure when the exact moment of change came, when I decided I was ready to take the plunge. Perhaps it was not just a moment, but more of a general realisation that no one was going to make this dream come true for me, nobody but me! So I am more than ready to put my all in to my baking, into constantly improving and trying new techniques and ideas and also then sharing all of this with you all! In terms of the blog, and this road to nigellahood we are in together, I now hope to have the time to invest more of myself and share my recipes, my musings and food ramblings with you all. Sugar, spice and all things nice… Autumn is here! As a November baby, I am very much a child of Autumn. Woolly jumpers, big blankets, falling leaves, candles, bonfire night and of course, pumpkin spice! A season that not only represents all of the things I love, but is also synonymous with all of my favourite flavours! As the days and nights start to get chillier, I also love how an afternoon of baking, is the perfect excuse to have the oven on for hours, slowly warming up the home and filling it with delicious smells! Warm the milk in a saucepan on a low heat, add the vanilla and butter, until the butter has melted. Mix the flour, yeast and salt in a large bowl, make a well in the centre and pour in the lukewarm milk and the beaten egg. Stir until the mix comes together, then tip onto an oiled surface and knead for around 5 minutes, until the dough is smooth. Pop the dough back into the lightly oiled bowl, cover with clingfilm, and leave to prove for around 1 hour. As your dough is proving, mix together the pumpkin puree with the maple syrup and spice mix. Taste to check the balance. Once your dough has roughly doubled in size it is ready, tip out onto a lightly floured surface and roll to a rectangle, around 30 by 20cm. Spread the pumpkin mix evenly over the dough, then from the long side, start to roll tightly to the other side to create a Swiss roll. Slice the roll into 9 thick rounds, roughly 4cm, and then place in a lightly greased square baking tin. Leave to prove for half an hour as your oven pre heats to 190/170 fan. Pop into the oven for around 25 minutes, until starting to turn golden brown. Once out, brush the slightly warmed apricot jam over the top as a glaze. Mix the icing sugar with a splash of vanilla and milk and drizzle over the top of the buns and then enjoy warm! Preheat your oven to 180/160 fan and grease and line a square cake tin/baking tray. Cream together the butter, sugar and vanilla until fluffy, then mix through the flour and the chocolate chips. Put roughly 2/3 of the mix into your baking tray and press down evenly to form the base. Stir a pinch of salt through the caramel and then pour and spread on top of your shortbread base. Crumble the remaining shortbread mix over the caramel, pressing together to form some larger lumps and some fine. Pop into the oven for 20-25 minutes until starting to go golden. Leave to cool in the tin before setting in the fridge for 1hour+, lift from tin and chop into slices. Apologies for my absence over the last month or so! Well in truth, I am not too sorry as I have spent an amazing 4 weeks in the most beautiful of places, New Zealand. For as long as I can remember the only place I have had on my travel dream list has been New Zealand and the trip was everything I could have possibly dreamed of and more! As this is a food blog, I imagine you are here for the food and more specifically the sweet stuff! Well, I took it upon myself to investigate whilst I was out there and try as much of the local sweet treats as I possibly could… you’re welcome! Here I shall share with you some of my favourites and in the next few weeks, keep your eyes out, as I recreate some of them myself with recipes just for you! It seems only right to start of with… Louise Cake! It seemed somewhat like fate that I would find my namesake cake in this amazing country that now has a very big slice of my heart! Luckily, said cake did not disappoint. Put simply the cake, or probably more technically, a slice, comprises of a shortbread base with a chunky layer of raspberry jam and topped with coconut meringue. As I would expect from a cake named after me, it pairs perfect with a big cup of tea! Next up, Tan Slice! Or as I now refer to it- Happy Slice, as I feel it’s impossible not to bring a smile to any who eat it! Again this slice is shortbread based with a thick layer of gooey caramel, topped with a biscuit crumble, sounds good right?! Well lucky for you, my first New Zealand Bakes post will be this delectable treat! So check back next Friday and in the meantime try not to daydream about it too much! One of our favourite food experiences was a banquet feast at Hobbiton, inside the Green Dragon itself! It was certainly a feast fit for hobbits with roast chicken, lamb shanks, beef stew, salmon, bread, roasted vegetables and countless other treats. Luckily I saved a fair bit of room for dessert which was beautiful fruit crumble, Bakewell tart and of course the Kiwi classic, Pavlova. A foodie trip to New Zealand just would not be complete without a trip to Ferburger! Hailed as one of the best burgers in the whole world, the constant long queue was not going to put us off! I have to say with such a lot of hype around it had a lot to live up to. But it really really was the best burger I have ever had! I went for a classic Ferg Deluxe with NZ beef, bacon and cheese and pickles and relish and ailoi, sounds good right?! It was also massive which of course got extra points from me! As well as Fergburger there in also a Fergbaker, where I may have spent a fair amount of my time (and money) whilst in Queenstown! Cookies, pastries, pies, croissants, breads, doughnuts, cakes… yep I had found my paradise. To put the cherry on top, next door was Mrs.Ferg, a gelateria! After pondering over and sampling many of the incredible flavours I had to of course go for pistachio and then a caramelised white chocolate and macadamia! So there is a quick sum up of an amazing trip and a stunning country that will always be in my heart. If you have any questions about what else we got up to, any recommendations if you’re planning a trip yourself, or just some more food chat please leave a comment! I shall see you next week for a recipe blog! Realised, as I begin to write this, that my recipe blogs of late have seemed to accidentally follow a theme... Nuts! I promise I shall attempt to branch into something different for the next one. But for now, it is time for a journey into peanut butter goodness! One of my favourite go to treats is flapjack and good flapjack really is hard to beat. One of the best things is its ease and simplicity to make, which is perhaps why my key memory of childhood baking centres around flapjack. My real love for baking did not seem to develop until my late teens, which still feels like a scarily long time ago! Childhood baking comprised mainly of flicking through a very old and worn copy of Delia Smith's Complete Cookery Course, to find one of two recipes. Crumble topping or flapjack! Flapjack was the first recipe I made all by myself and the very first recipe committed to memory. Nowadays my head is swimming with all sorts of cake recipes and ingredient quantities that there is not much room for anything else! I have made this flapjack extra special and deliciously decadent, indulging both your sweet and savoury teeth! Peanut butter and jelly, or as we in the UK call it, jam, is a flavour combination incredibly close to my heart and stomach!! This flapjack is sweet, sticky, salty, crunchy, chewy and more... enjoy! Pre heat your oven to 180 degrees or 160 fan. Pop the butter, peanut butter, sugar and syrup in a saucepan over a low heat, stirring occasionally, until it has all melted together. Stir through the oats and then pour into a lined brownie tin. Spread the mixture out and flatten lightly before dolloping the jam on top in blobs. Press in the raspberries and for extra crunch you can add some salted peanuts as well! Press everything down firmly and then pop into the oven for 20-25 minutes until bubbly with beautiful golden edges. During my current love affair with the pistachio, I have highly neglected my other favourite nut, the pecan! So what better thing to bake than a dessert based around the pecan itself, the humble Pecan Pie of course! It must have been years and years since I have even eaten any form of pecan pie and my only memory of ever baking it goes right back to childhood and a highly burnt outcome that neither looked nor tasted like anything resembling a pecan pie! Luckily since then my baking skills have somewhat improved! As well as the pecans themselves, for a pie, you of course need pastry. I have somewhat of a love hate relationship with pastry, in that I love nothing more than eating it, but making it always fills me with slight dread. Perhaps justly for the extra effort and mess involved. But also for the lack of cohesion in my pastry skills. Some days I am a pastry pro and can make a picture perfect pie. Other days I seem to opt for a rather more rustic style, with slightly crumbled uneven edges. However, as pie is the quintessential home baked treat, I feel the slight imperfections only add to its charm, and that is the story I shall be sticking with! Put your flour into a mixing bowl and using the largest holes, grate in the butter and then rub flour and butter together with your fingertips, until the mix resembles breadcrumbs. Rub in the icing sugar and then add the egg yolks. Mix to form the dough, adding a splash of cold water, if the pastry feels too dry. Bring the dough together in a ball, wrap in clingfilm and chill for at least an hour. Roll out the dough, on a floured surface, big enough to line roughly a 9inch loose bottomed tart tin. Prick the base lightly with a fork and pop back into the fridge for 30mins. Pre heat your oven to 180/160 fan. Line your pastry case with baking paper and then fill with baking beans, if you don't have any, raw pasta will work just fine. Pop into the oven for 15 mins, carefully remove the baking paper and beans and return to the oven for 5 minutes or until lightly golden. Now, onto the filling, beat together the sugar and softened butter until light and fluffy, then beat in the syrups. Gradually add the beaten eggs and then vanilla, along with a pinch of salt until fully combined. Stir through the pecans and then pour into the tin. Increase the oven to 200 or 190 fan. Pop the tart on the middle shelf and bake for 10 minutes. Reduce the temperature to 160 or 140 fan for 35-40 minutes, until the pie is golden brown with just a slight wobble. Leave the pie to cool and then chill in the fridge, preferably overnight, to fully firm up. I am a sponge girl through and through, sponge cake, sponge pudding, sponge is my go to! Therefore, it seldom happens that cheesecake creeps into my mind. But for all of last week, cheesecake was haunting my every thought! I just could not get it off my brain! There was only one thing to do! Get baking! To make a cheesecake that was going to fully satisfy these cravings, it was going to have to be exceptionally good! So I threw one of my favourite ingredients at it for luck, the pistachio! The humble pistachio, you may have noticed, creeps its way into a fair few of my baking creations. As does white chocolate. So it may not be a great surprise that I have paired them together again and they work beautifully in this deliciously creamy cheesecake. Pre heat your oven to 180 or 160 fan. Line the base of an 8inch round spring form cake tin with baking parchment and lightly grease the sides. Put your pistachios, saving a couple for decoration later, and your biscuits into a food processor and blitz until fine crumbs. Mix together with the melted butter then pop into your tin and press down evenly and firmly to form the base. Pop this into the oven to bake for 10 minutes and then leave to cool. Heat the double cream gently in a saucepan over low heat, then add in the white chocolate and stir until fully melted. Leave to cool slightly before blending with the cream cheese, eggs and vanilla. Beat until the mixture is smooth. Now the only slightly technical part, your cheesecake needs to be baked in a bain-marie, to ensure it is evenly baked. All you need to do is wrap the base and sides of your tin in a layer of clingfilm and then a double layer of foil, to ensure your tin is watertight. Then pop the tin in a deep roasting tin. Pour your cheesecake mixture over the biscuit base. Then fill the roasting tin with boiling water, going half way up the level of the cake tin. Pop this into a slightly cooler oven, 140 or 120 fan and bake for 1 hour. Once your hour is up, turn your oven off, leave the cheesecake in, with the oven door slightly open and leave to cool for a couple of hours. This should prevent any cracks forming on the top. Your cheesecake may still appear to be slightly wobbly, don't worry, it just needs to chill and fully firm up! Leave it in the fridge overnight and the next day it should be firm. Un-clip your tin and pop the cheesecake out and onto a serving plate. Sprinkle some chopped pistachios over the top for a pop of colour. And then dive right in and enjoy the smooth silky creaminess of your cheesecake! I love the colours of this cake. The perfect Spring time cake to reflect the sunshine we've finally had this month! This cake was a gluten free sponge cake with classic jam filling and vanilla frosting. I love this style of buttercream piping, adding the layers and details to create an intricate beautiful design. 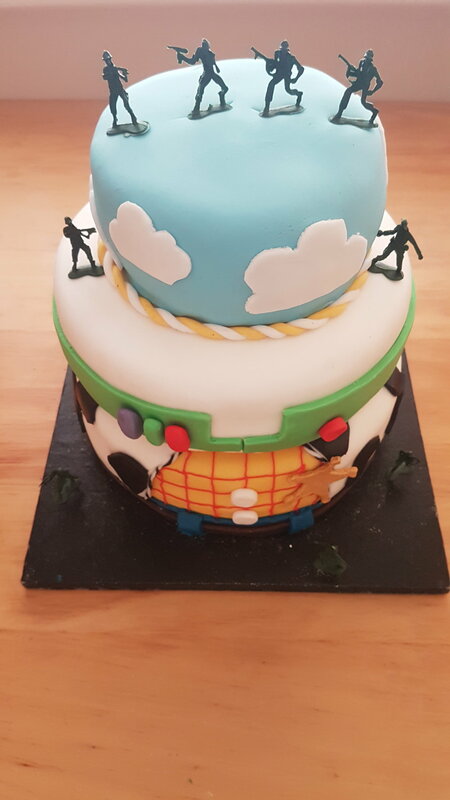 Check out some of my other similar styled cakes here! Light lemon sponges, filled with zesty lemon curd and topped with a snowy mountain of meringue. Need I say anymore?! I also had some fun playing around with these meringue kisses. Not sure why I had never made them before, but beginners luck gave me a perfect bake to create a crisp shell with a delightful chewy meringue centre. The colours, the flavours, the doughnuts. This was a very fun cake to make! The sponge was pistachio and white chocolate with fresh raspberries baked through and layered with raspberry jam! The doughnuts were peanut butter flavoured and layered up on top with plenty more with chocolate, of course! April has been a month of love in the Louise's Cakes kitchen! Starting off with this lovely cake for the engagement party of two beautiful friends of mine. After a very romantic proposal (at New Years in Paris! ), they invited us all to celebrate with them and every celebration, of course, needs a cake! A classic Victoria filling with gold drip detailing. I'm already excited to start planning the Wedding Cake! I told you it was a month of love! This was only my third ever wedding cake and I can now say I've done them all, a naked cake, a fondant cake and now a buttercream cake! This simple yet striking 4 tier was made up of a vanilla base, then a chocolate layer, then a very special cherry bakewell layer and topped of with a lemon sponge. Wedding cakes are the cakes of all cakes and being able to be a small part of someones special day will always be an amazing feeling! March 1st- Website goes live! After editing, tinkering and applying the finishing touches for over 2 months, I finally felt ready to go live! I am in no way a technological whizz kid, nor do I really know the first thing about making a website, but here I am... and I am pretty proud of my efforts. 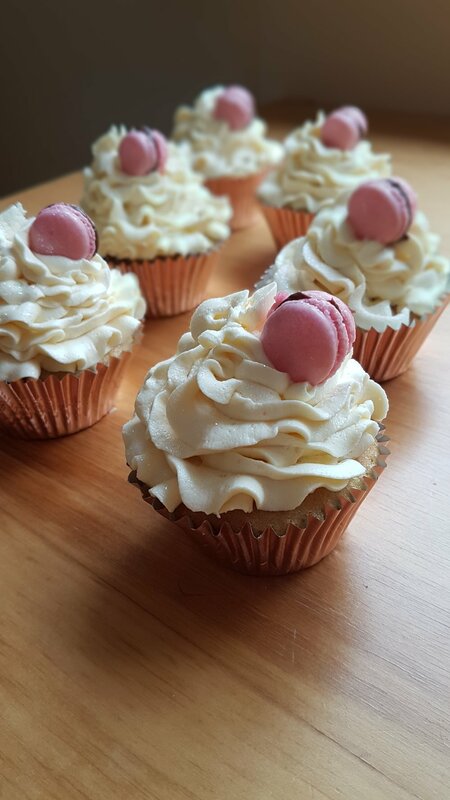 So if you haven't yet had a look around please browse at leisure through all my cakes and cupcakes and cookies, a big cup of tea and a small snack may be needed to stop you getting too hungry! My first order of the month was for a lovely ladies 21st birthday. This was a special order, as just three short years ago I was making her 18th birthday cake! I love following clients through their lives and being there to help them celebrate all their special occasions. This cake order was also a lot of fun, as it involved 3 of my favourite things- chocolate, cookie dough and mermaids! A 3 layer moist chocolate cake sandwiched together with cookie dough buttercream and dripping with chocolate ganache... drooling yet?! 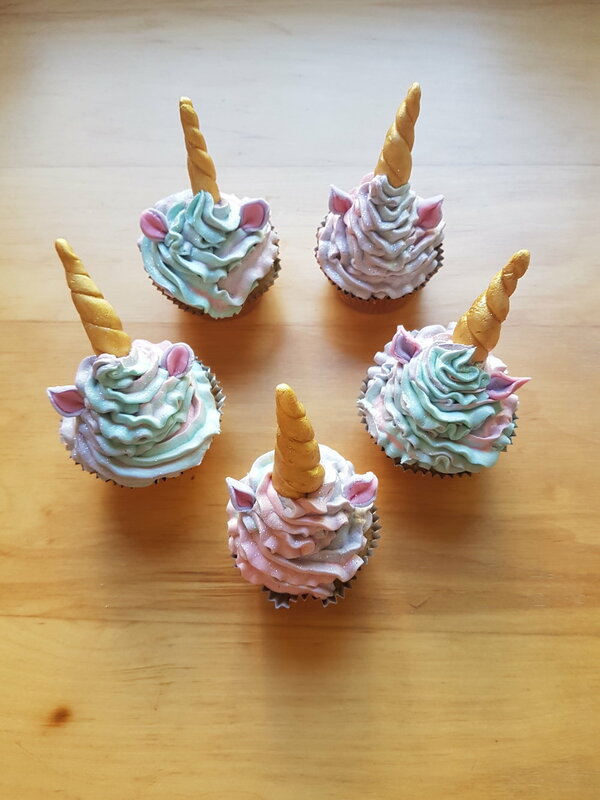 Accompanying the cake was some very fabulous mermaid cupcakes. A Disney girl at heart, Little Mermaid has been my favourite for many many years and I like to think of myself as a bit of an Ariel! I love how big the mermaid theme is at the moment and was very excited to have an excuse to unleash my inner mermaid upon my cakes! Nutella is one of the great loves of my life. On toast, on a spoon and especially in cakes. This decadent delight is a chocolate lovers dream. Moist chocolate sponge, nutella ganache, chocolate buttercream, ferrero rocher, hazelnuts... the list of delights goes on! I will never grow tired of making this masterpiece! One of the things I love about doing bespoke cakes is just how personalised they can be. This cake would make little sense to anyone else. But for the lovely lady who was retiring to Anglesey, to relax by the coast and play golf, it was perfect! Having complete free reign on a cake is pure joy for me. It is where my childish, bright and sweet filled imagination can run wild. This cake, created for my best friends 25th, was brilliantly bright, cheeky and childish and certainly a sweet treat. Beneath the hundreds of hundreds and thousands was a cherry bakewell cake and the top tier dripping with hot pink ganache, was a heavenly raspberry, white chocolate and pistachio cake. So now we are in April already! The sky is currently, for once, very very blue and the hope of Spring, sunshine and blossom has finally returned. With a month of engagement cakes and wedding cakes ahead, love is definitely in the air! Easter is finally on it's way! I think we are all desperately hoping that it will bring with it some sunshine and signs of Spring! But whilst it is still cold and miserable outside, I have got a recipe which will bring rays of joy to your kitchen! Where there is Easter, there is hot cross buns, and as delicious as they are toasted and slathered in butter, I have found a way to elevate them to new heights. 1. In a shallow dish, whisk together the egg, milk/cream, vanilla, cinnamon and sugar. 2. Heat the butter in a frying pan on a medium heat. 3. Slice each hot cross bun in half and flatten out slightly, dip each half in and out of the egg mixture, on both sides and then place straight into the hot pan. 4. Fry for 2-3 minutes and then flip over and cook through on the other side. The bun will start to go golden brown when ready. You wont find too many recipes in my repertoire which could be classed as healthy! I am a girl who likes her indulgences! But, when a cake still tastes delicious, who am I to complain that it is also pretty much fat free?! It simply means I can eat twice as much with half the amount of guilt! 3x ripe bananas- the riper the better! Pre heat your oven to 180/ 160 degrees fan and grease and line a loaf tin. Soak your dates in a bowl in some boiling water. With an electric whisk, beat together the bananas, sugar and eggs until light and creamy. Fold through the flour, baking powder, vanilla and spices until thoroughly combined. Finally, stir through the soaked dates, with a little bit of their liquid. Pour into your loaf tin and pop into the oven on a low shelf for around 45-50 minutes until springy to touch. Leave to cool in the tin and enjoy at your leisure! Welcome to my new blog! Here you will find all my musings, recipes, photos, reviews and thoughts, all on my very favourite subject... food! I have been food blogging far too infrequently for about 4 years now, over on my previous blog 'Feeding My Inner Fatty'. As I was designing my new cake website, I felt a fresh start all around would be just the kick I needed to get back into the blogging habit! So whether you're an old follower who's joined me on my journey or you've just stumbled across my ramblings, welcome!